I'm a fan of a one pan wonder, a dinner that only requires one pan to cook everything in. Now let me introduce you to the sheet pan wonder, a dinner that only requires a sheet pan to cook multiple ingredients at once. 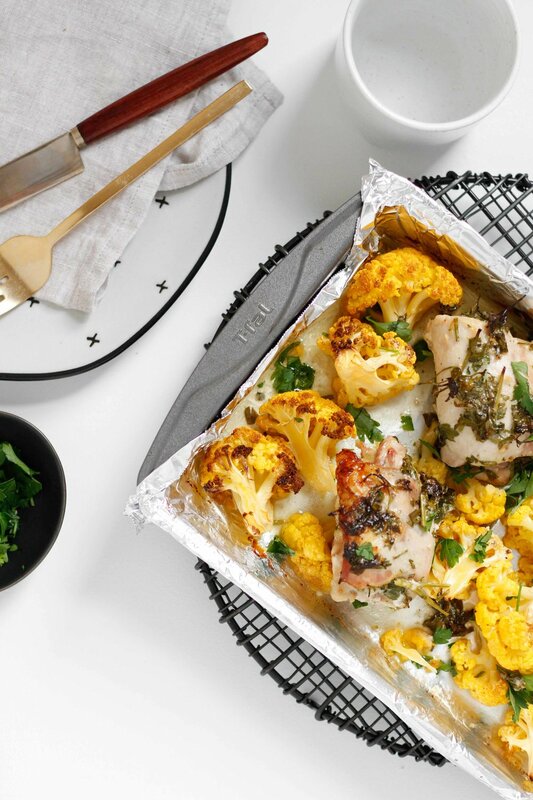 I love a good sheet pan chicken situation, and this one is a pleaser. Lots of us grew up dipping our carrot sticks into ranch dressing, but marinading our chicken in ranch? Ok, that's new! Trust me, it's delicious and slightly tangy, and makes the easiest marinade ever. Ranch dressing typically contains herbs like parsley and plenty of garlic, so I added a bit more fresh parsley and garlic for even more punch. I chose cauliflower because I love a roasted cauliflower situation, plus I think it does a great job at absorbing all of that ranch flavor. In a bowl combine the chicken thighs with the chopped fresh parsley, ranch dressing, and garlic. Set aside for 15 minutes or so to marinate the chicken. Spray a foil-lined pan with cooking spray. Lay the cauliflower florets in a layer, then add the chicken thighs. Any leftover ranch or parsley used as the marinade can be added on top of the chicken thighs, or discarded. Bake the chicken and cauliflower in the oven for 40-50 minutes until the cauliflower softens and the chicken begins to brown. Serve the chicken and cauliflower with a sprinkle of salt and more fresh parsley on top.